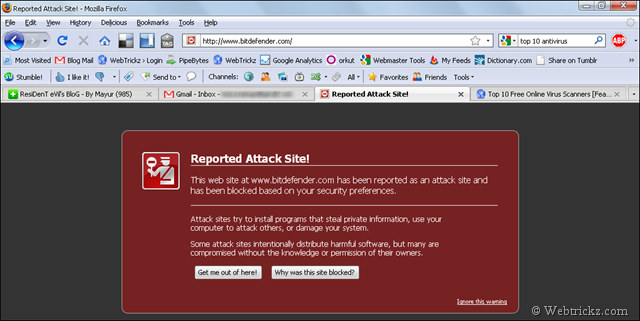 BitDefender website reported as an Attack/Malware site by Firefox & Google Chrome ! While I was searching for some Top Antivirus, I came to open the website of famous BitDefender Antivirus and was shocked to see the site reported as an Attack site by Mozilla Firefox. This web site at www.bitdefender.com has been reported as an attack site and has been blocked based on your security preferences. Then I tried it on Google Chrome and got same results there also. The website at www.bitdefender.com appears to host malware – software that can hurt your computer or otherwise operate without your consent. Just visiting a site that hosts malware can infect your computer. The sub-domains of http://www.bitdefender.com/ were also giving out the same results. Lastly I tried to open the site on Internet Explorer and Safari and it opened like a charm there. Update – Error No more occurring. Our post made them correct it. Let us know if you find any answers. As one ‘developer’ of a site that has been labelled by Firefox’s latest rigid updated version of 3, I think this is unfair as this is commonly of no fault of the site developer/webhost. unnecessarily that have potentially become infected through no fault of their own. Other browsers don’t show this degree of ’sensitivity’ (nor, insensitivity!!!) that this latest FF update does; it simply is too much caution. Leave the security issues with the host, leave out the inconvenience from the users. We urge FF to disable this damaging and reckless feature. Try SOSWEBSCAN its powerful and working fine to remove label of “REPORTED ATTACK SITE” from website.